What happened to the original TamaTown? Bandai officially shutdown TamaTown on February of 2013. I miss TamaTown! Will Bandai, or you, bring it back? Many members of our community have emailed Bandai to ask this. Emails either go unanswered or are replied stating there are no plans to bring the original TamaTown back. What does this screen mean? It means your batteries are dead and need to be replaced. Why do my P1/P2 re-releases keep dying? The re-released Gen 1 and Gen 2 Tamagotchis have had their programming changed. 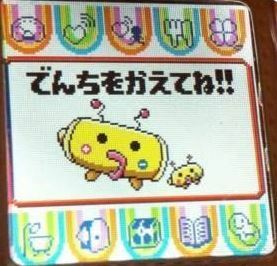 Feeding your Tamagotchi snacks can result in death around the age of 3, even with perfect care otherwise. How can I remove scratches from my Tamagotchi screen? WHERE CAN I BUY TAMAGOTCHI'S?